Ok, it’s a bit of an unbelievable and elaborate story I think, so here’s the short of it. Granted, it’s worthy of easily being the most awesome story of its kind for me, but for now, this is all I can say about it. So, my friend Zack Rosicka is an amazing guitarist. He lives in Florida, and being 9 hours away, it’s been a long time since I’ve seen Zack. 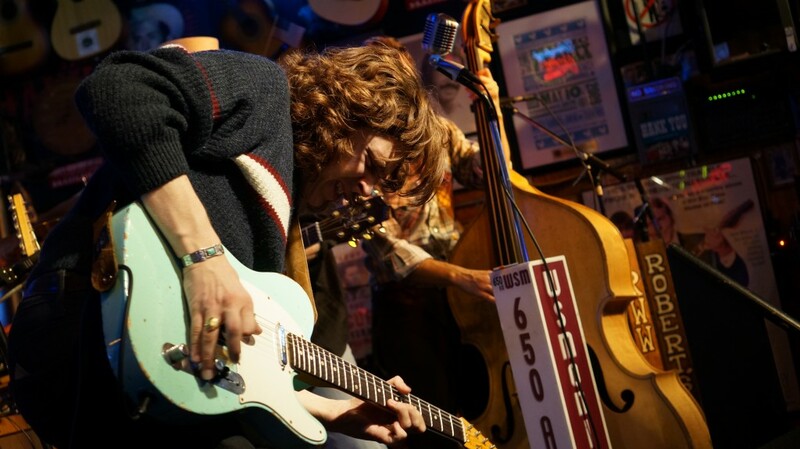 But, knowing the I try to frequent Nashville as much as I can, Zack and I coordinated our desires to venture there via a gig he was to perform at. Zack was extremely excited because of the type of gig it was. I had no clue, I was just excited to see and capture Zack doing his thing. Then about 2 days before the gig Zack canceled. I was down about the prospect of suddenly not going. So, curious to see who the showcase was for that Zack was going to open up. I Googled Joe Robinson and watched a video and was impressed. Then I heard one of his songs and at that time that was all I could really find on him without digging a little deeper than I really wanted to. I called Zack back and explained I was looking forward to it, ready to go, and curious if I could still videograph the showcase. Thirty minutes later Joe’s personal manager was calling me. If I recall correctly, the show was going to be on a Friday. I drove up that Thursday and ventured to Broadway. That night I covered what I thought would be the most awesome player I’ve ever seen, and he is absolutely up there, Rory Hoffman. Rory is simply amazing, and not just on the guitar, on everything, you name it and he’ll play it unbelievably! 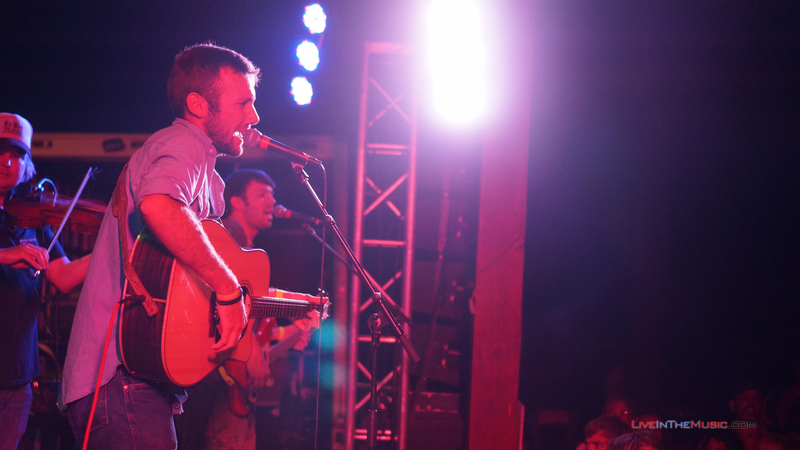 Friday night’s showcase for Joe Robinson was at 12th & Porter. I had no time to setup, really, like 10 minutes. And in about ten minutes I had 3 cameras surrounding the stage and was capturing audio off the board. The venue was tight and a bit uptight about me being there. But, it was understandable because this place is top shelf and they are already geared up and ready to go. Joe’s performance was incredible. I could not have been prepared for how awesome of a performer Joe Robinson is. He is pure talent. I was anxious to get home and edit. But, I figured I would hang out and meet Lanndon Lingerfelt’s team. Lanndon is a young and great country artists that I love to work with. When we were done I rushed home about 7 hours and went straight to editing. That Saturday night/Sunday morning I started putting videos on YouTube. I shared them with Joe’s personal manager and later Sunday evening I received phone call from Joe’s manager and she was ecstatic. I later found that Joe had been watching the videos closely analyzing his performance. In appreciation for what I did they came to visit me here in Shelby, NC! I couldn’t believe it and didn’t really know how to act or what to do. It was raining, they didn’t have much time, so we went right to checking out some places where we could possibly video Joe some. They had stayed in Gastonia, so we met at Tequilas to get a bite of some yummy Mexican food. Then we went straight to my house. After showing them around my house we considered it as a possible place to do some video work. Then we went uptown to see if there was anywhere we could possibly setup. At that time there wasn’t many options. It hasn’t even been a year since then, but now there’s the Earl Scruggs Center and several new little types of venue possibilities directly across from the Center that have since opened or relocated. And since Joe’s visit I have desperately wanted start my own venue. After checking out a few places, we decided on a coffee shop called the Lillybean in Uptown Shelby. I set up and we shot a few songs in their guest area. But after Joe noticed the bathroom he decided that would be a great spot. 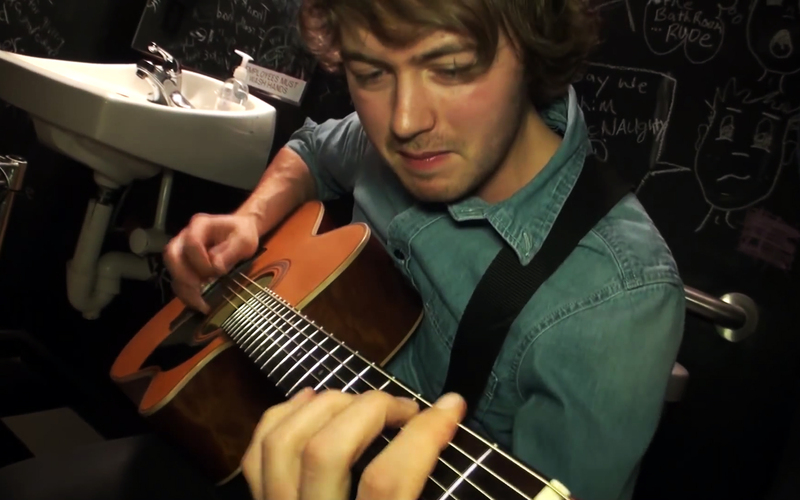 And so we bring to you Joe Robinson performing “Slow Drip” in the bathroom of the Lillybean. The Lillybean has since moved so there’s no memorial service opportunities at the location. But feel free to watch the video on Joe’s YouTube channel. It’s the first one he’s put on his channel in a long time and it’s still the most recent one after almost a year. The only thing is, in respect to the amount of effort that was involved, the Slow Drip video in the bathroom involved practically no effort. I used one camera handheld and he recorded the audio with his smart phone. I synced it in post and wahlah, Joe’s happy! But what about the 12th & Porter show? The 12th & Porter show videos are not public at this time per Joe’s request. After their visit I videographed Joe at the Atlanta Braves game where his power trio played in the plaza area. And at the end of the game they rolled a stage out before the fireworks and Joe performed solo on his acoustic. 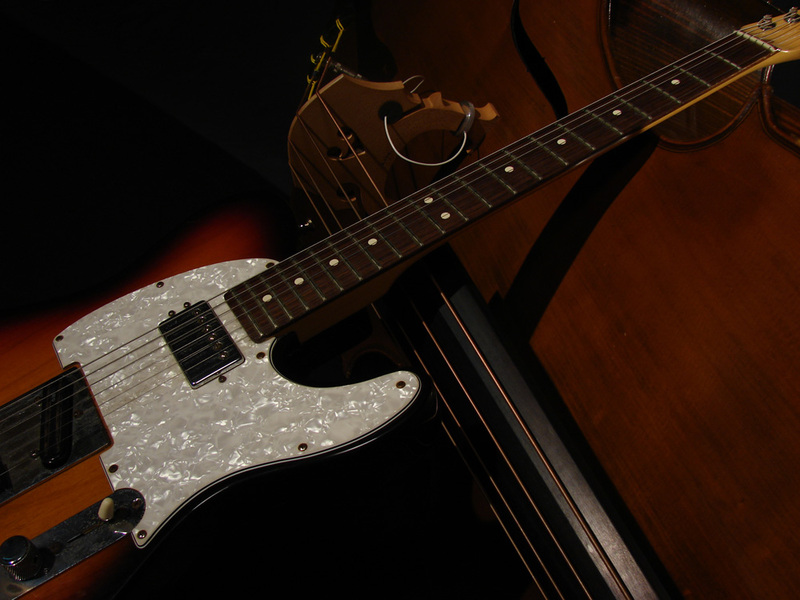 Then I covered Joe’s trio at Eddie’s Attic in Atlanta and more recently at the Double Door Inn in Charlotte. The only videos Joe’s team will allow me to make public is the bathroom video. Yes, that is right. A video shot with one camera, took about an hour to edit, render, and upload, and was only about a mile from my home is the only video at this time. They love the other videos, but only want the one. So, at this time over 22 hours of driving, 8 hours of shooting with multiple cameras, probably another 20 or more hours of editing, and a days worth at least of uploading is all eclipsed by a 3 minute and 51 second song that took about an hour. Ask me, go ahead, it’s an obvious question, was it worth it? Of course, Joe is INCREDIBLE! While Joe and his manager were here at my families home my son became quickly attached. Joe’s music is outstanding and totally appropriate for every age. William, my son, listened to his music every day throughout the entire summer. I loaned out a few of his CD’s, he has quite a few and they’re all great. Unfortunately, the person I loaned them too keeps forgetting to return them 🙁 So, let this be a lesson to you! When you get your Joe Robinson CD’s don’t loan them out. And, if you have kids, you may need to buy an extra copy because they’re likely to wear them out!